Wholesale Canvas Prints On MakeCanvasPrints! Wholesale Canvas Prints Just Got a Whole Lot Better! We’re proud to announce new pricing for MakeCanvasPrints wholesale canvas prints! By improving our bulk canvas prints process we’ve been able to pass the savings on to you for high volume and high quantity canvas prints! We’re able to accept large run canvas prints for photographers, offices, and events in both RGB and CMYK format. Please get in touch with us over on MakeCanvasPrints to learn more about our wholesale canvas prints and wholesale canvas printing. Who Uses Wholesale Canvas Prints? The most common customers on MakeCanvasPrints in the past have been: photographers, artists, major brands, small to mid sized commercial offices, residential housing units, hotels, and organizations with large spaces like universities and churches. A large order of canvas prints is one of the easiest ways to add color and differentiate wall space. Based on the size of your prints, the design of your prints, and the delivery date of your prints pricing may vary. Please let us know of any special color requirements or any particular design notices in advance so we can be sure your order is perfect! Contact MakeCanvasPrints about your wholesale canvas print order today! 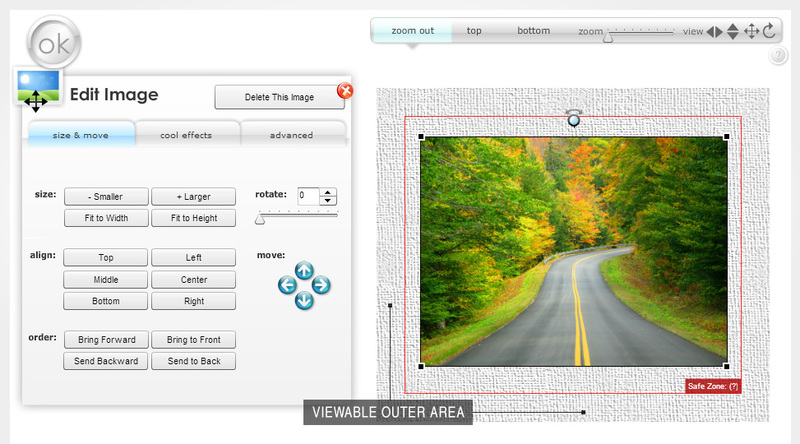 We’re happy to announce the availability of a new feature for Canvas Wraps Customizer (or any custom rectangular printed product where the graphic wraps around the squared edges). 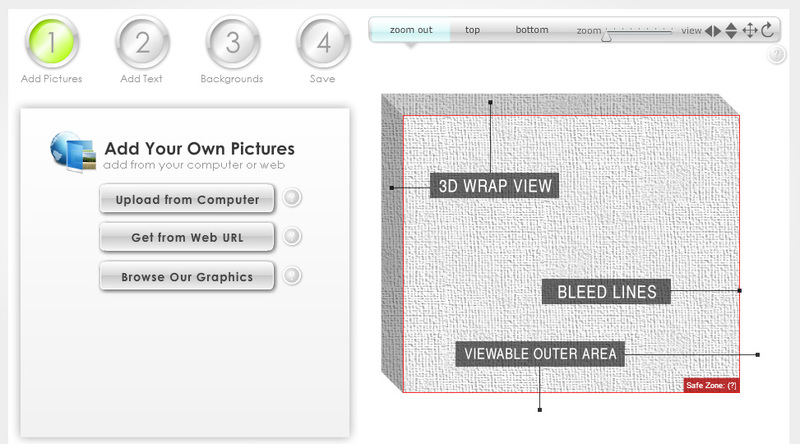 The 3D Wrap view helps users understand instantly where the “bleed” and “wrap” zones are instantly, without having to think about what a “bleed” is or read the help bubble trying to explain the concept. This makes accuracy of print images increase significantly, as many users previously were a bit confused about where their text should and shouldn’t go. The feature consists of automatically switching between a 3D-Wrap View, a 2-D Full Template view including outer bleed/wrap areas, and the final Cropped Straight-On View. 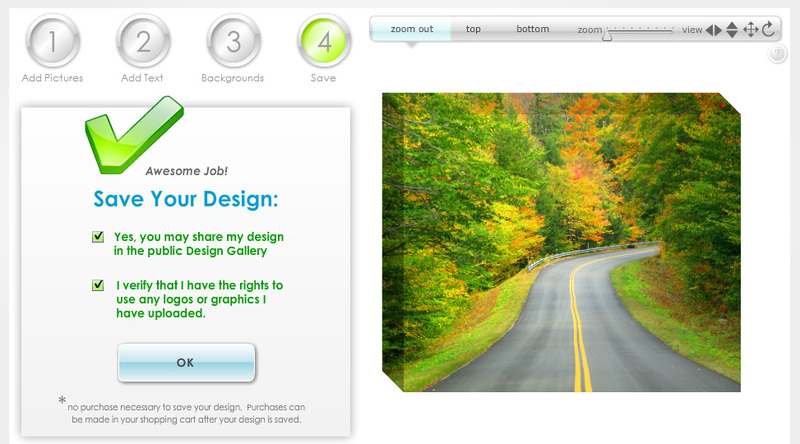 The first two, the 3D wrap view and the 2D Full Template view, switches back and forth automatically as the user works on their design. When they mouse over the canvas, they see the full view, to position their objects inside the red bleed/wrap guide line, keeping their text inside the “safe zone”. When they reach step 4 to complete their order, the outer areas of both views are cropped off and hidden to show the final product straight on, eliminating any question of what will be cut off around the edges vs on the front face of the canvas. This final straight on view sends thru as their main image, staying consistent with the traditional artwork view that is expected on art print and canvas sites. Our manufacturers’ specs are met to the inch and pixel with exact settings to ensure accuracy. Users can’t be bothered with understanding DPI, PPI, bleed in inches, or any of that. The information is there for them in a help bubble if they are curious, but really they want to know what they see on screen is what they get in the mail, and that’s exactly what our accuracy can ensure.